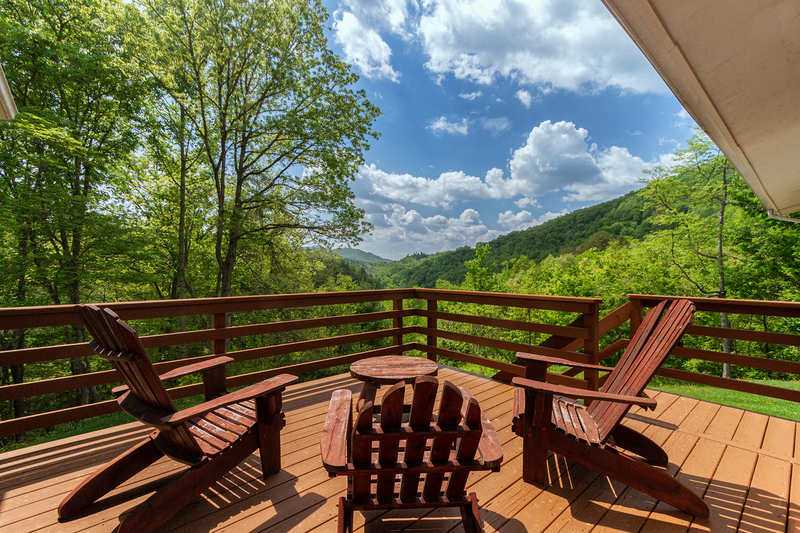 The Hideaway in Nantahala North Carolina Mountains. 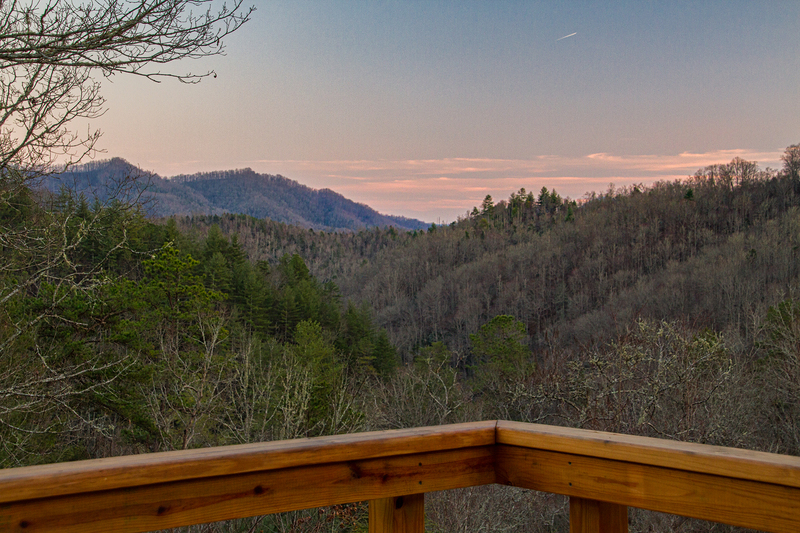 Large secluded mountain cabin with a large upper covered deck to enjoy the fresh mountain air. 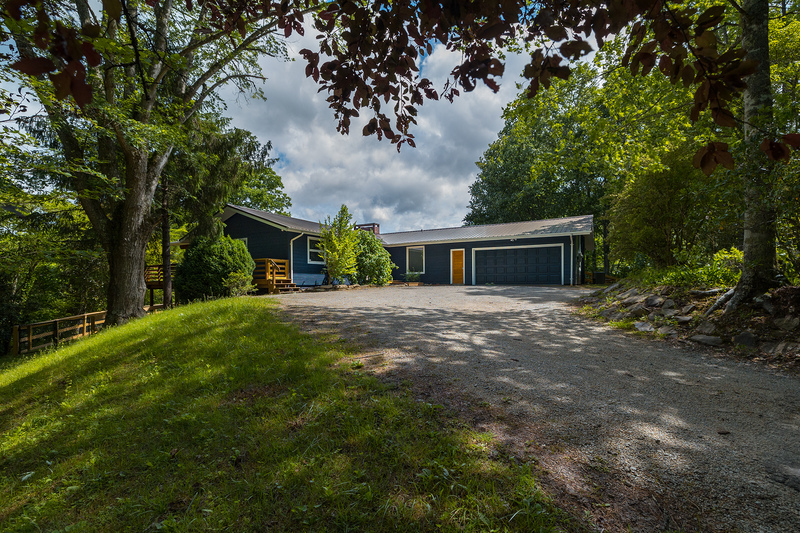 Four bedroom two story Secluded Family Vacation Home with Easy Access to All the Popular Area Attractions. 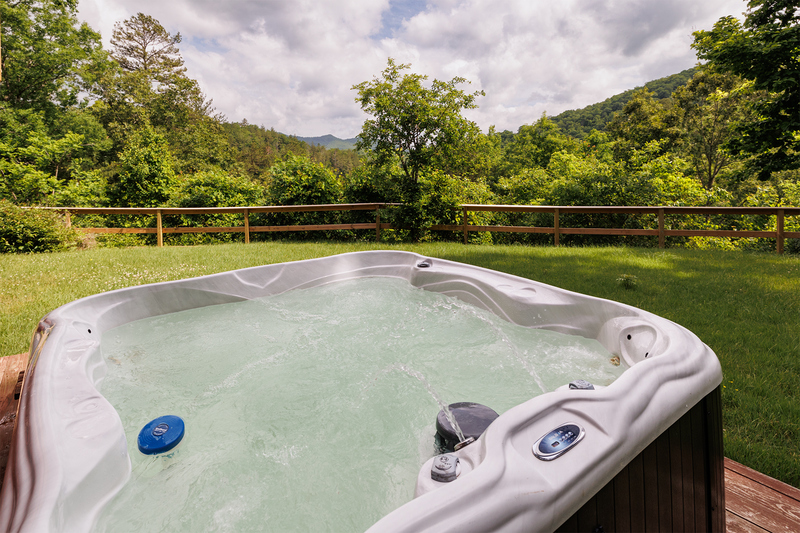 Let the warm massaging waters of the outdoor hot tub soothe your stressed muscles. Stop and sit in the fresh mountain air and watch the clouds drift across the mountains. Mountain view from the upper deck. 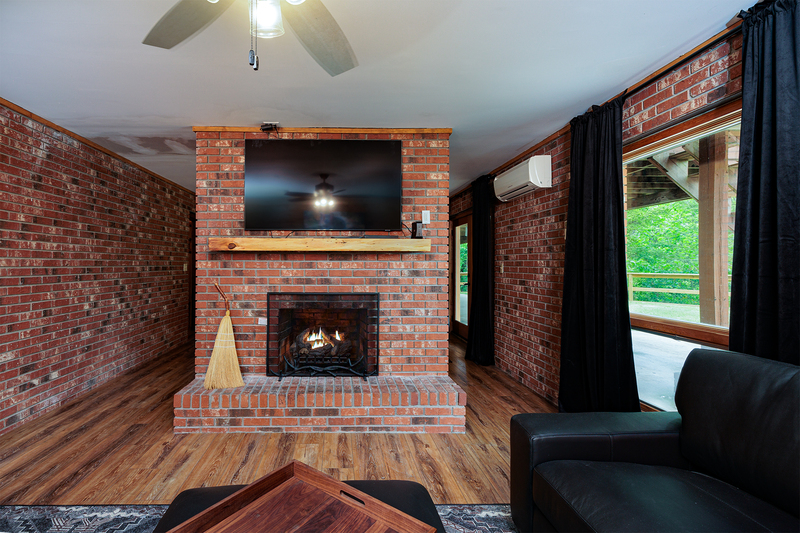 Plenty of seating and natural brick gas log fire place makes a casually comfortable living room. The large custom wood dining table seats 6 guest. 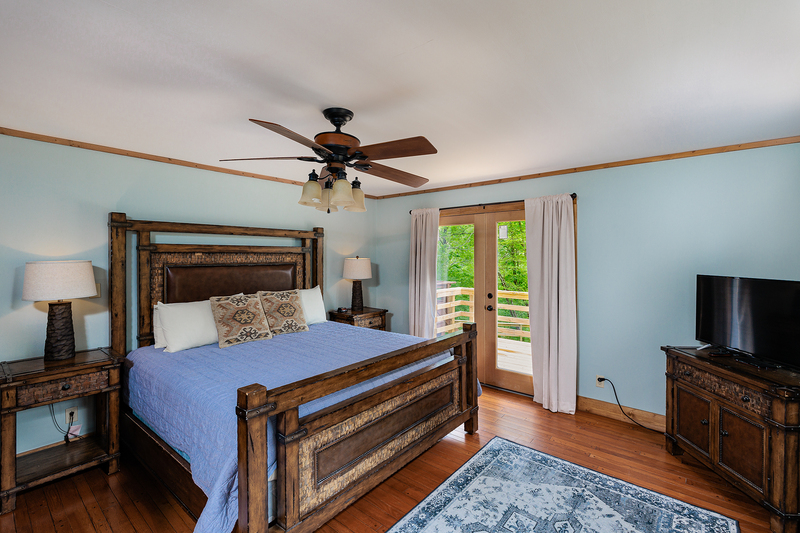 The master bedroom on the entry level has a king size bed and view of the mountains. 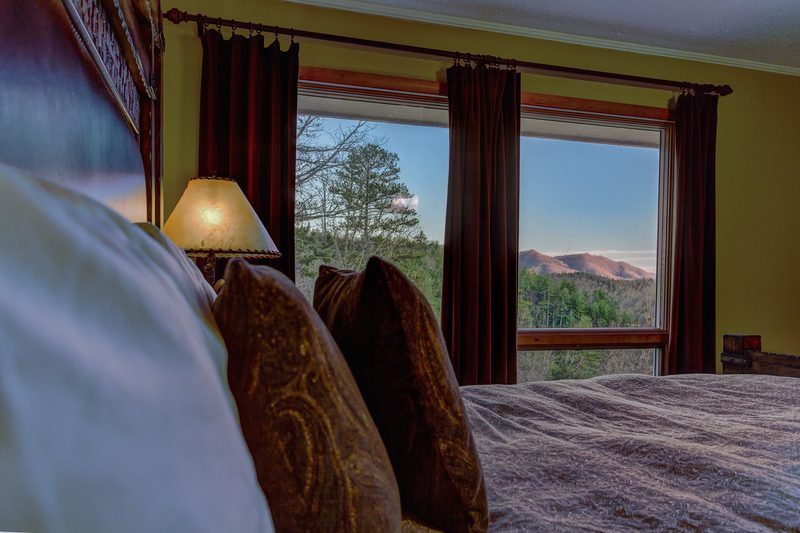 Wake to the sight of the sun shinning across the mountains from your pillow in the master bedroom. The second bedroom on the entry level has a queen size bed. On the opposite side of the fireplace wall in the family room two futons provide seating to watch some TV or as extra sleeping space. 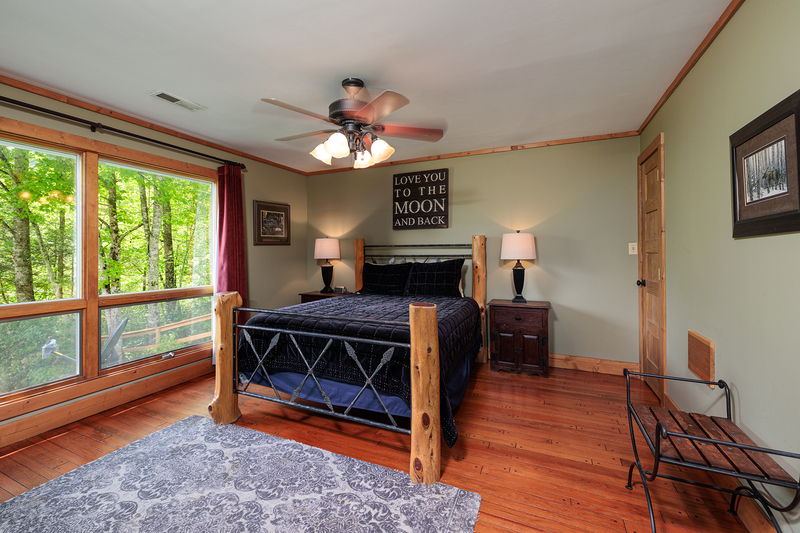 The third bedroom is on the lower level and has a queen size log framed bed. The kids room on the lower level has a twin over full bunk bed and a separate twin bed. 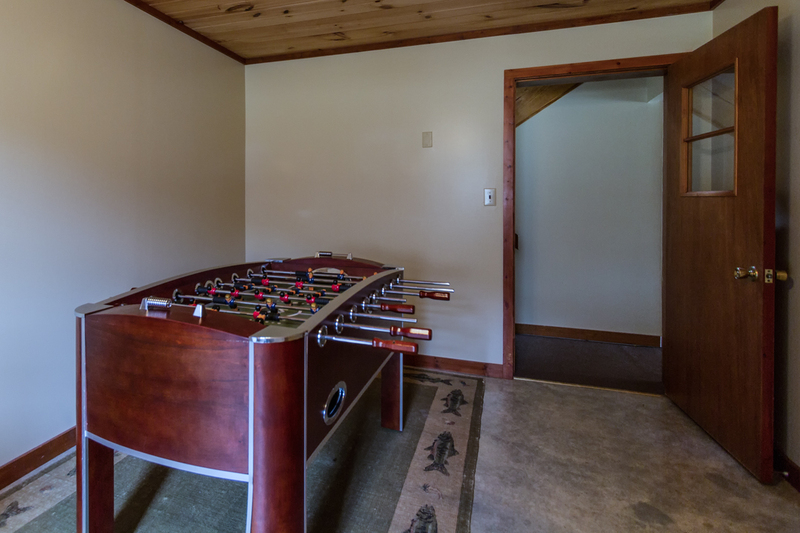 Fooseball table on the lower level. 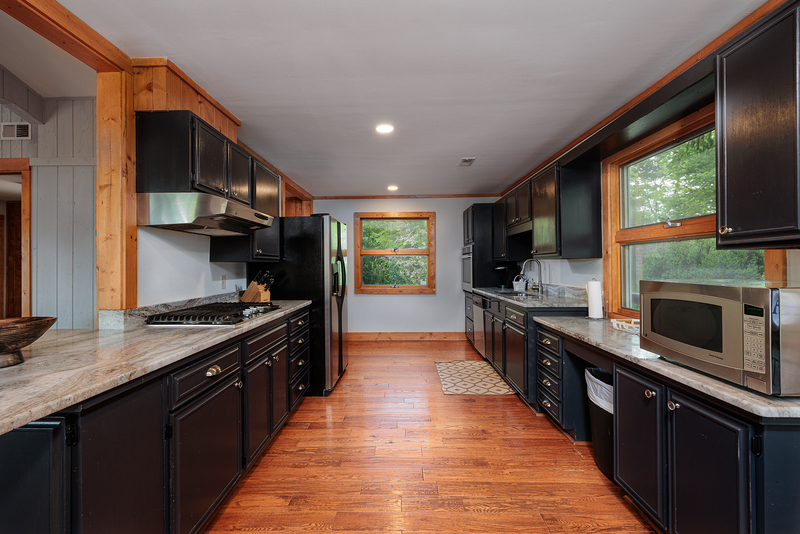 The large kitchen is fully equipped with all cooking and dining utensils needed to prepare an at home meal. Dish washer too. 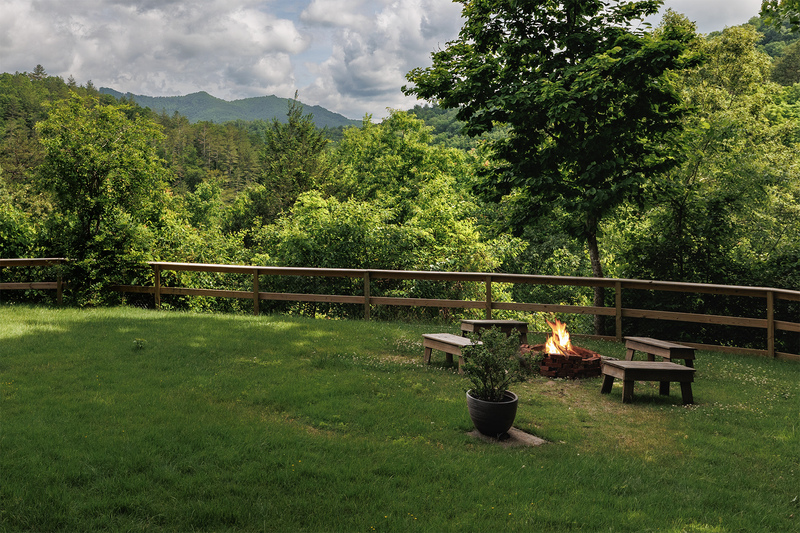 Gather the kids around the fire-pit to show them how to make smores as the sun sets over the mountains and the fireflies fill the night air. The gas grill and covered dinning table for enjoying a late night meal outdoors. The well illuminated covered upper deck is a great place to enjoy the cool night air. 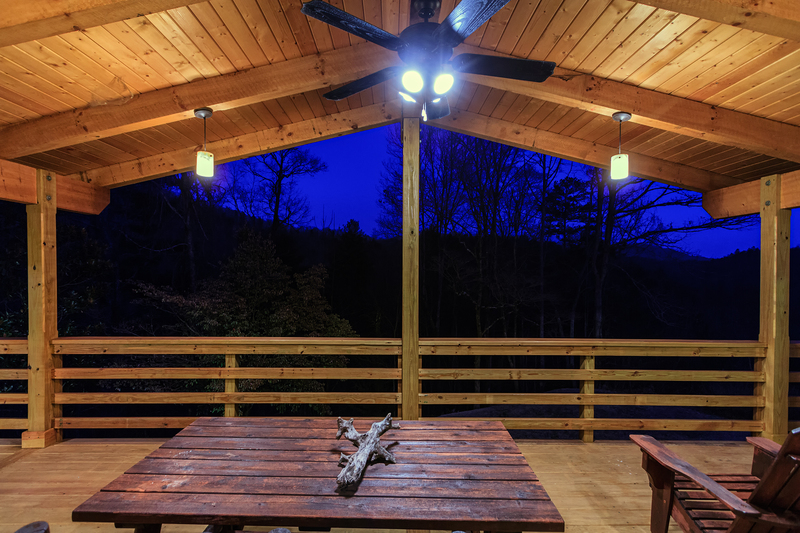 The upper deck has lots of seating to relax in the cool air and watch the fireflies light up the night sky. Rates are listed per night based upon 8 Guests. 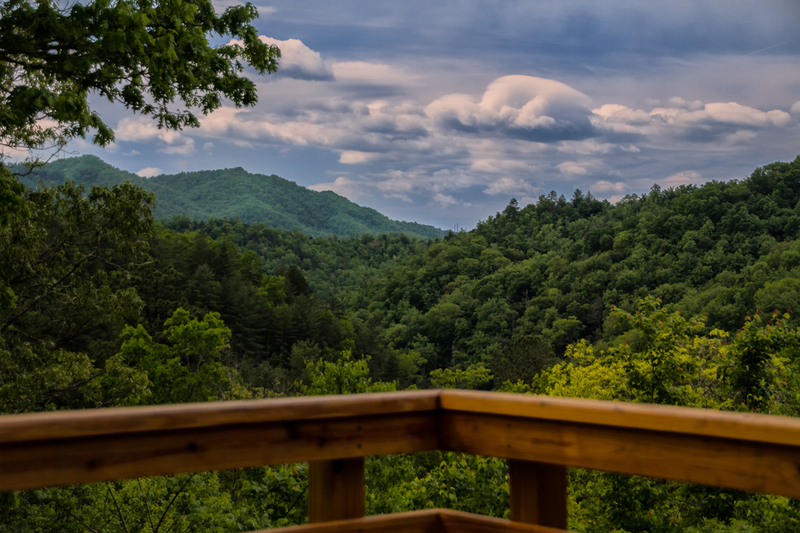 The Hideaway is located just 10 minutes from Bryson City, and 20 minutes from Cherokee. 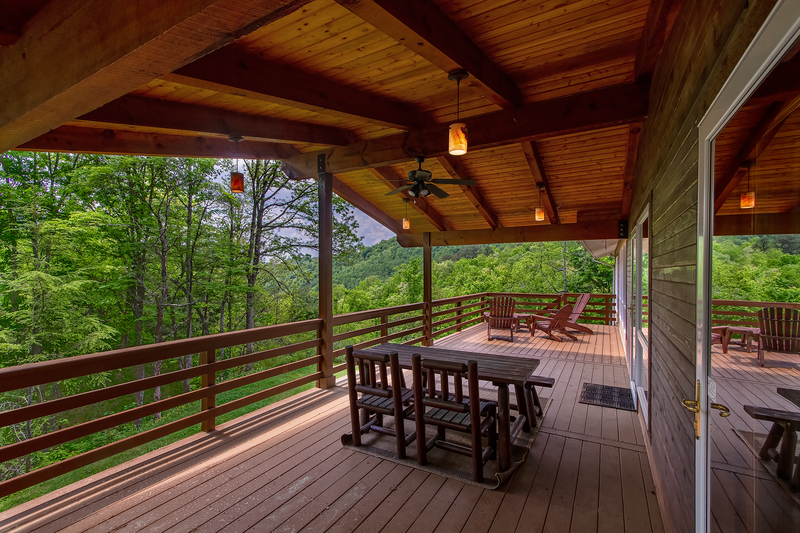 It is nearby Fontana Lake, the Nantahala Outdoor Center and Tsali Recreation Center. This area offers a lot of outdoor adventures. 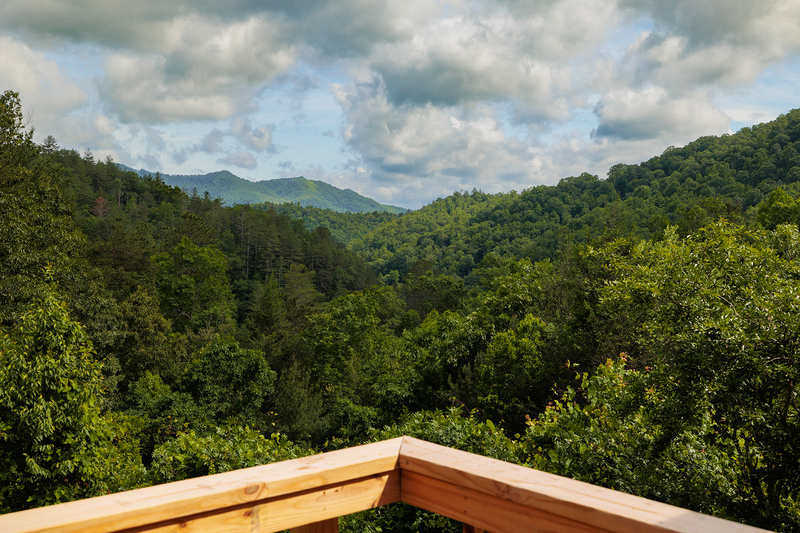 You can explore the Great Smokies National Park, The Blue Ridge Parkway, Deep Creek, and so much more. Pontoon boat rentals are locally located, as well as mountain bikes. You can also enjoy a scenic trip along the Great Smokies Railroad. You may need to extend your vacation just to get it all in! 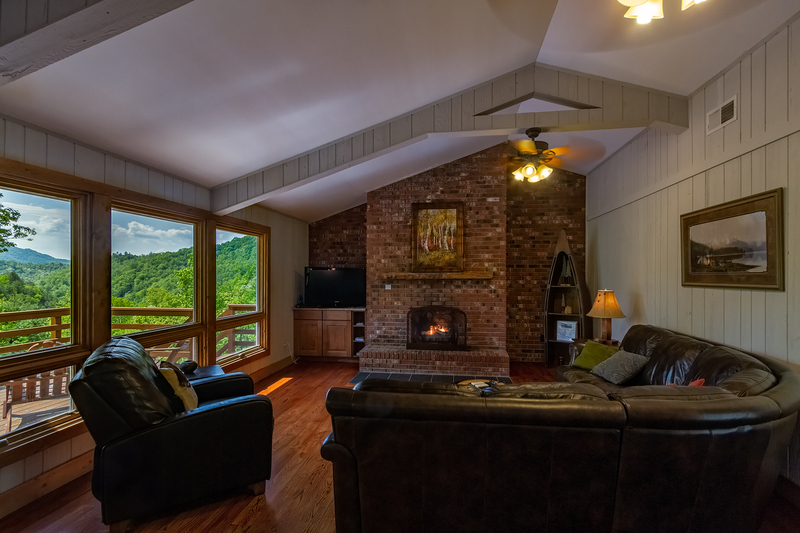 The Hideaway is a perfect mountain vacation home for a larger family or group of friends to get away at and still have it all. Up a partially paved driveway, a large gravel parking area provides plenty of space for several vehicles. 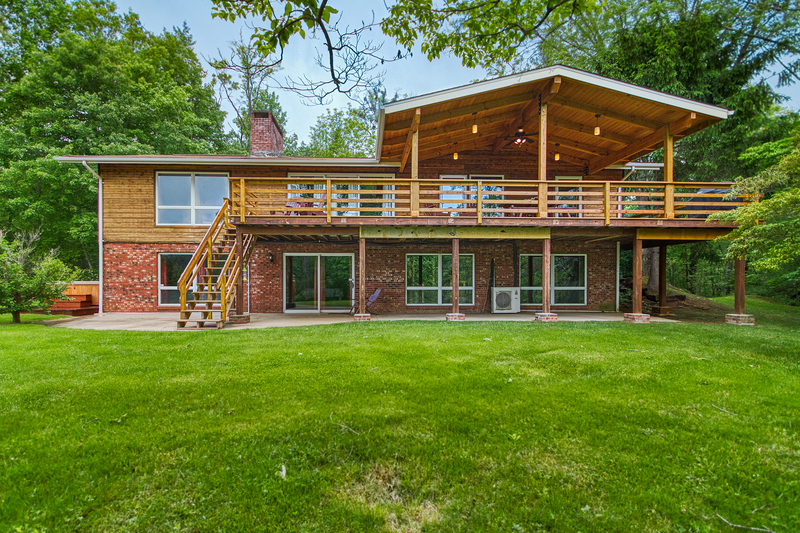 This home sits on a very spacious wooded lot with mountain views to be enjoyed. 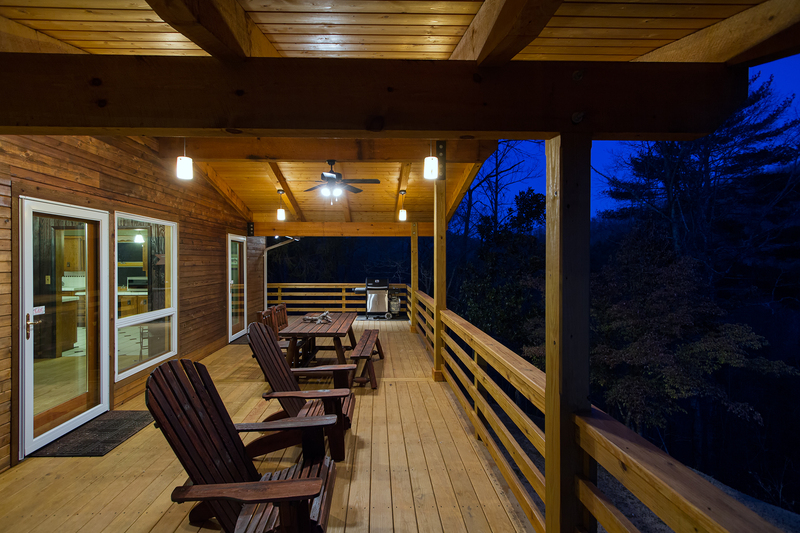 The exterior living space offers a hot tub on the lower level as well as a fire pit area. Both ideally located for privacy and views. 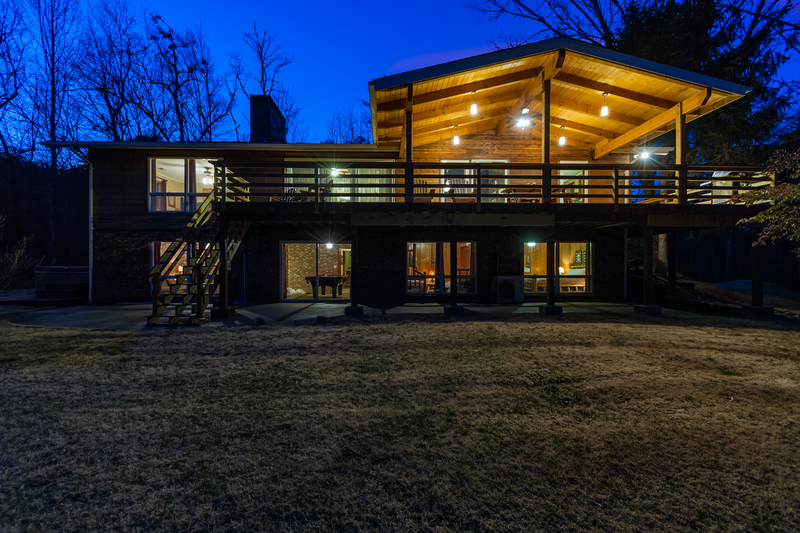 A large yard extends along the side of the cabin providing lots of space to run and play for the kids. A warm summer night will have them chasing lightning bugs while the flames from the fire pit illuminate the darkness. 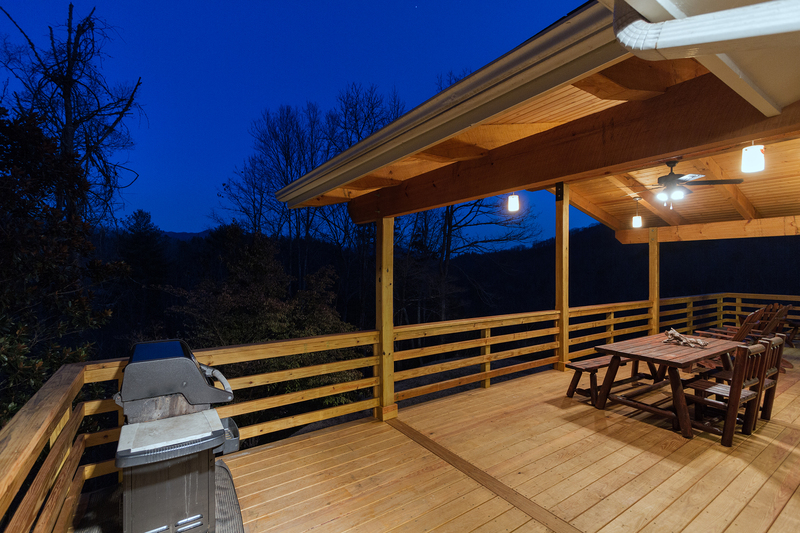 The upper deck is partially covered and has lots of seating, a great location to take in the views and grill up a nice meal on the gas grill. 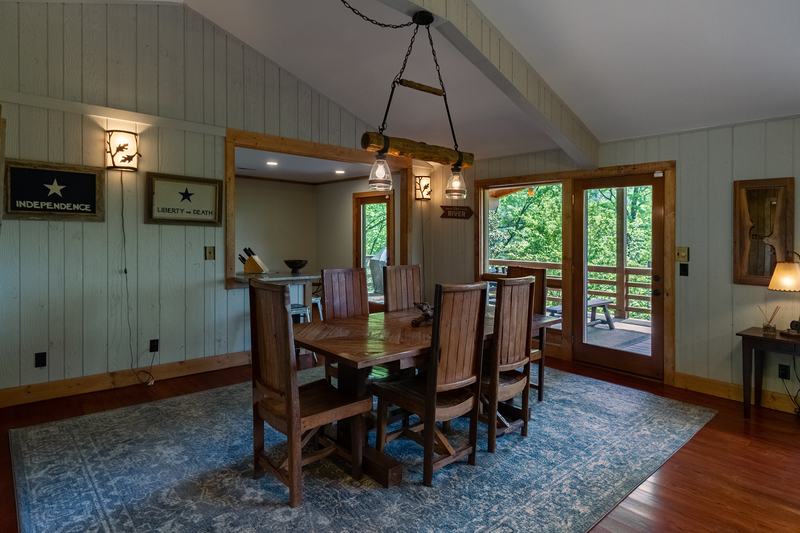 The front door brings you inside this comfortable mountain retreat, entering to the left will lead you to the kitchen, straight ahead will take you to the living and dining area, and to the right you will find the bedrooms and bathrooms. A large floor plan gives all guest plenty of space to unpack and settle in. Hardwood floors pull you into the living room, with high vaulted ceilings and exposed beams. A large gas log fireplace creates a cozy atmosphere to kick back on the leather sofas and relax together. There is a satellite TV to keep you up to date on your favorite shows. Large windows bring nature right into this room, as well as pulling you out onto the deck through a door to access the fresh mountain air. To the left is the dining area, and right around the corner is the kitchen. It is very spacious, and everyone will be able to help out with meal time. There is a second dining area here. You will find the kitchen is fully equipped and all you need to prepare meals is provided. Down the hallway there is a full bath, a king size master bedroom, which also has a satellite TV, and a queen size bedroom. Both private and inviting. 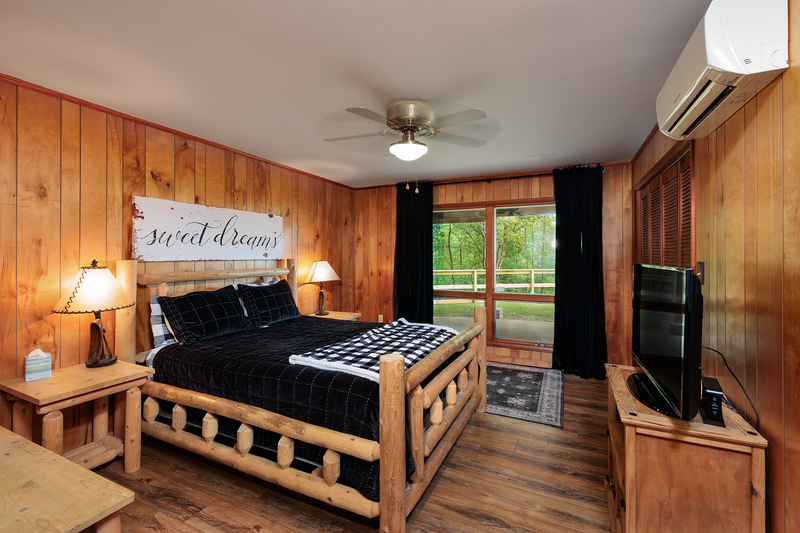 Comfortable bedding ensures a great night’s sleep after a busy day exploring the Smoky Mountains. A stairway located in the hallway of the main level takes you down to the additional bedrooms, a second full bath, game room, den, and laundry area. This home provides more than enough space for any retreat. At the base of the stairs a hallway spans the downstairs. First up is a large room with a washer and dryer. 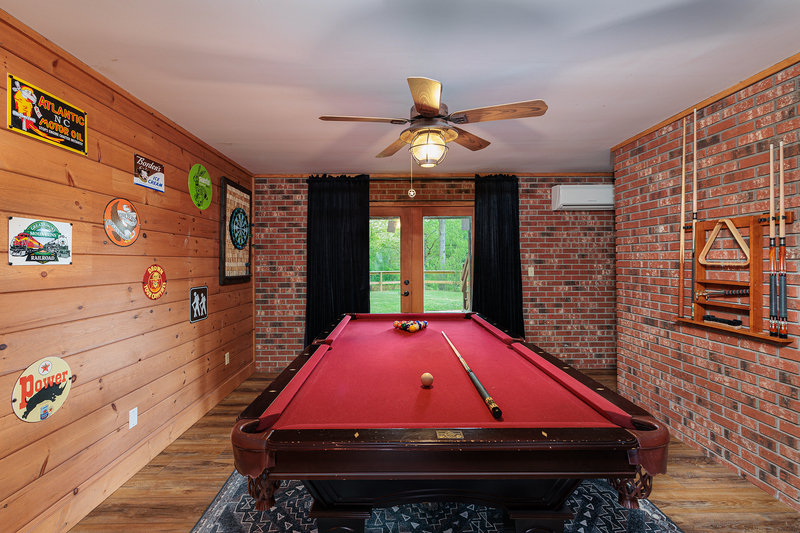 The next room you come to is the game room and den, separated by a large brick fireplace. You can challenge each other to a game of pool. 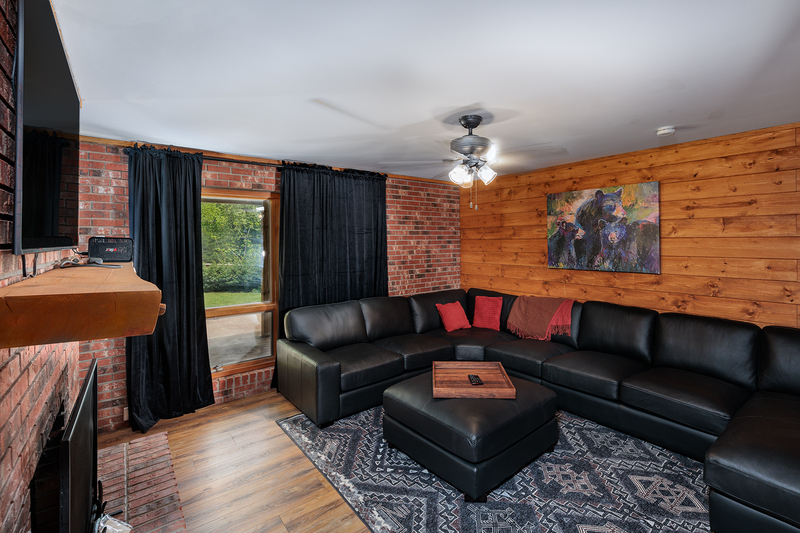 If you prefer to just hang out and relax, the cozy den is just around the nook of the large fireplace. A set of gas logs warms up this space. Two leather futons provide seating or additional sleeping space. There is a third satellite TV and Wii gaming system located here. From this room there is an exterior door which takes you out to a patio, and has easy access to the hot tub and fire pit area. Back inside, and down the hallway you come to a third bedroom. 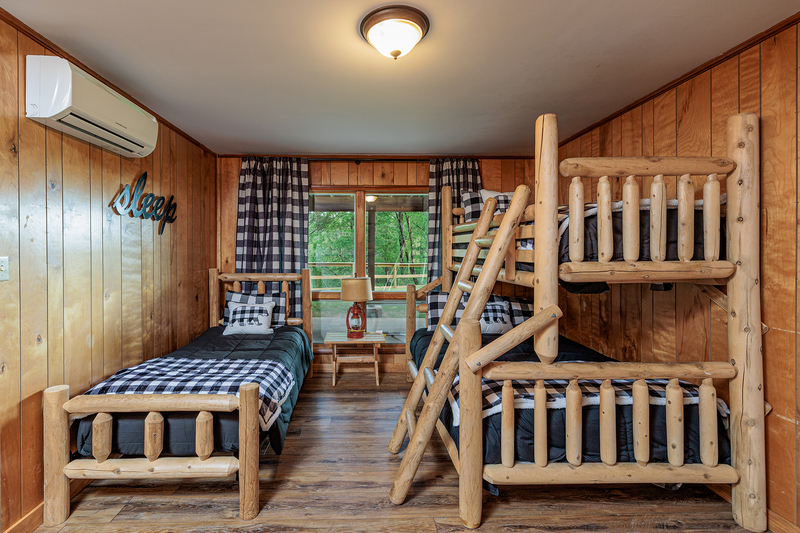 This room features a bunk bed with both a twin and full bed, as well as an additional twin size bed. Next you will come to the fourth bedroom, it has a queen size bed. At the end of the hallway is the second bathroom. It also has a shower and tub.